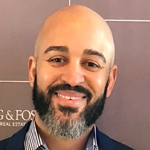 Phil Gerdes, a sales associate with Long & Foster’s Annapolis Fine Homes Sales, has been named as the Rookie of the Year for the company’s Baltimore region as well as companywide. Gerdes has demonstrated great leadership and customer service in his growing real estate career. He sold more than $12 million in real estate volume in 2017, earning him a place in the Founders Club on Long & Foster’s Gold Team. He also earned a spot in the Anne Arundel County Association of Realtors Master’s Club, for having at least $6.5 million in settled volume.